This product requires the base game For Honor. The Year of the Harbinger is upon us! 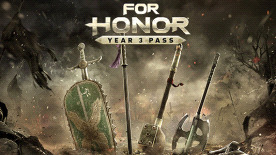 Enhance your For Honor® experience with the Year 3 Pass. Get VIP early access to 4 new Heroes, plus exclusive bonus content. The For Honor Year 3 Pass includes one week early access to 4 new Heroes coming in 2019, one from each faction. An elite outfit for all 4 Heroes.